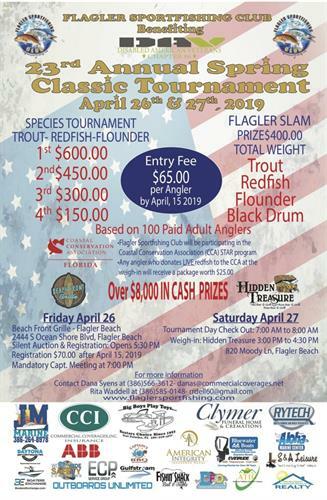 Flagler Sportfishing Club (FSC) will host its 23rd Annual Spring Classic Tournament on April 26 and 27, 2019. Over 120 anglers will be vying for over $8000 in cash prizes and merchandise to catch Redfish, Trout and Flounder. Proceeds from the Annual Tournament benefit the local chapter of the Disabled American Veterans (DAV), Chapter 86. FSC will also be assisting the Coastal Conservation Association (CCA) STAR’s program held May 25 through September 2, 2019. FSC tournament anglers will be donating live Redfish to be tanked and tagged by the CCA at the weigh-in. The fish will be released throughout the coastal counties for the STAR Tournament. The donating anglers will be registered for a drawing to win a Bulls Bay rod and reel worth $500. Anglers that catch a STAR Tagged Fish between May 25th and September 2nd have a chance to win $500,000 in prizes.